My response has always been, “Remember the shamrock represents the love of the Irish people.” In Christianity, the shamrock represents “God’s Eternal Love”- the Father, the Son and the Holy Spirit. 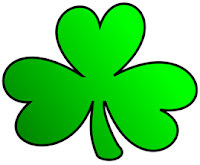 In the ancient pagan belief, the three leafs of the shamrock represents the Earth, water and fire (Sun), all the essentials for the “Love of Life”. Hence the shamrock is compiled of 3 hearts. So it truly is easy to draw. Start by drawing a heart then add a heart attached to each side and finally add a stem to hold your "Irish Love”. Easy!